Climate change alarmists continue to preach the dogma of global warming in a textbook case of cognitive dissonance, despite record low temperatures in different points around the globe. This past week, Buffalo and Watertown, New York, registered their coldest week in recorded weather history. Boston, too, is set to tie its record of seven straight days with temperatures remaining below 20 degrees, reports Weather.com, which has not been seen in Beantown for exactly 100 years—since the week ending January 4, 1918. 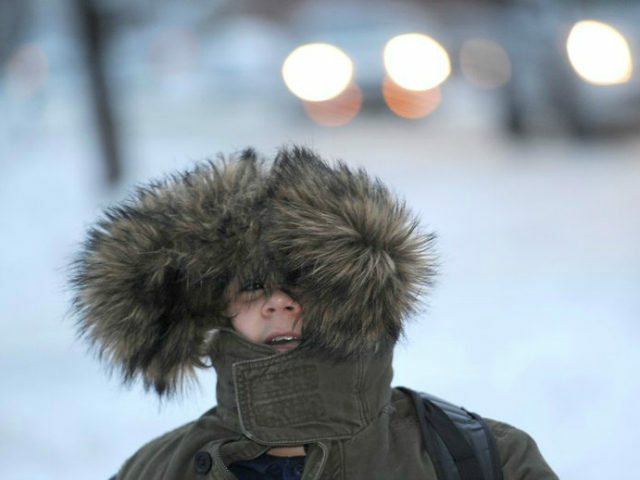 Flint, Michigan, set its all-time record-low temperature for December of 18 degrees below zero last Thursday morning. North American cities too numerous to mention have been setting records for daily low temperatures, as the gelid weather wave shows its impressive staying power. For instance, the National Weather Service reported a temperature of minus 15 F in Omaha on Sunday, breaking a record low dating back to 1884. During the summer period, mainstream media offer an ongoing stream of reports of how climate change is causing higher temperatures and severe weather, yet when temperatures drop to record lows in wintertime, they write them off as normal cyclical weather phenomena. USA Today ran a defensive piece titled “It’s cold outside, but that doesn’t mean climate change isn’t real.” The article cited authorities pointing to other points of the globe that are experiencing warmer than average temperatures, in a bid to relativize the cold spell. The ironic thing is, of course, that when the media speak of unusually hot weather as a sign of global warming, they never seem to look for places where it is unusually cold to show nature’s balance. Meanwhile, USA Today also cited Shepherd, who stated that daily or weekly weather patterns “say nothing about longer term climate change,” something one never hears during the summer months when news outlets are falling over themselves to point to “yet another” indication that burning fossil fuels is making the earth a hotter place. Jonathan Overpeck, a climate scientist at the University of Michigan, claimed that the recent record-cold weather is not only happening despite global warming, but, indeed, “at least in part” because of it. Overpeck’s theory is that a loss of Arctic ice has allowed more heat to transfer from the ocean to the atmosphere, causing a weakening of the polar vortex winds over the Arctic. As a result, more freezing Arctic air is swooping further south, he proposes. “That is due to the warming of the Arctic, which in turn is due to human emissions of greenhouse gases and primarily burning of fossil fuels,” Overpeck declared. In other words, all weather behavior—whether colder or warmer—becomes a confirmation that manmade global warming is real.